Start building electronics projects with Netduino, the popular open source hardware platform that’s captured the imagination of makers and hobbyists worldwide. 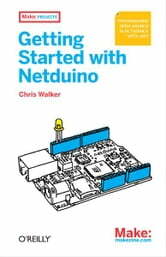 This easy-to-follow book provides the step-by-step guidance you need to experiment with Netduino and the .NET Micro Framework. Through a set of simple projects, you’ll learn how to create electronic gadgets—including networked devices that communicate over TCP/IP. Along the way, hobbyists will pick up the basics of .NET programming, and programmers will discover how to work with electronics and microcontrollers. Follow the projects in sequence and learn techniques for building your own Netduino-based devices.